"A delicious and easy Christmas Eve recipe for your family." 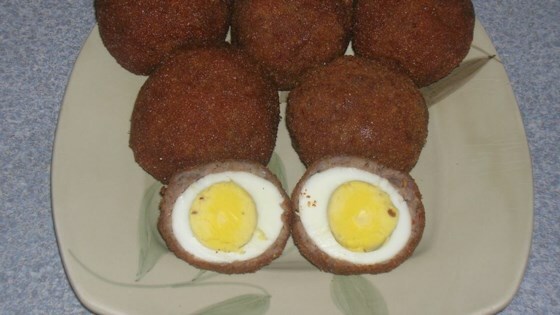 See the secret to scrumptious, sausage-wrapped Scotch eggs. Very good. I use Jimmy Dean Maple Sauasage. To cut back on fat, I bake these at 350 for 45 minutes. My kids (2&8) love these! Recipe needed a little help- I baked (325 for 45 min)instead of frying and turned out great served with hollandaise sauce and family loved it-not a recipe to make on a monthly basis but good. My personal opinion it's to die for served with a good mustard and a black and tan beer. only then one can say they have eaten. It is worth the effort to prepare.